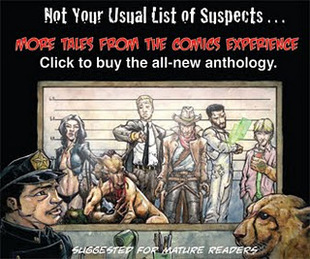 From some of the hottest new writers and artists breaking into comics now, More Tales from the Comics Experience presents futuristic gunslingers, wisecrackin' midget cops, daring space adventurers, monsters where you won't expect them, and more! Alternately suspenseful, shocking, adventurous, and funny, this 52-page, 8-story anthology of stories was workshopped under big-time former IDW and Marvel editor Andy Schmidt's guidance in his Comics Experience writing classes (he also contributed the foreword). Presented in stunning black and white, the stories in this book will grab you as they twist and turn, leaving little room for you to catch your breath between tales. Read a review here. This collection also includes an exclusive interview with legendary writer Chuck Dixon on breaking into comics. Suggested for mature readers. Click the pic to buy your copy from Indy Planet.